Mayor Martin J. Walsh and others broke ground on the new Boston Arts Academy building on Tuesday. This ground breaking is part of a broader agenda by Walsh moving forward with a sweeping plan to overhaul the school system&apos;s aging buildings. The goal is to develop a predictable and transparent planning process for school construction projects, which the district has lacked for decades to the frustration of teachers, parents, and business leaders. School officials will gather community input over the next two months and, depending on what they hear, alter the plan before the School Committee votes in December. The proposal comes 1½ years after a city commission review found that most of the system’s 125 schools — two-thirds of which were built prior to World War II — were in need of significant repair or renovation, but did not specify how to fix them. That, in turn, has stoked fears of school closings and consolidations, especially as districtwide enrollment has dropped by nearly 8,000 students since the turn of this century from about 63,200 students to 55,445 last fall. The recommendation to close the two high schools has already created a stir at Urban Science Academy and West Roxbury Academy, which collectively educate about 750 students, including many with autism and other disabilities. The school communities, which have protested budget cuts in the past, are expected to mobilize, and supporters took to Twitter Tuesday to air their concerns and publicize a letter announcing the closures. “They’re sending the students and teachers of West Roxbury Academy & Urban Science Academy all across the system with a two-word explanation ‘deep analysis,’ ” one tweet exclaimed, referring to language in the letter outlining the case for closure. “This is really terrible for these kids and teachers,” wrote another. 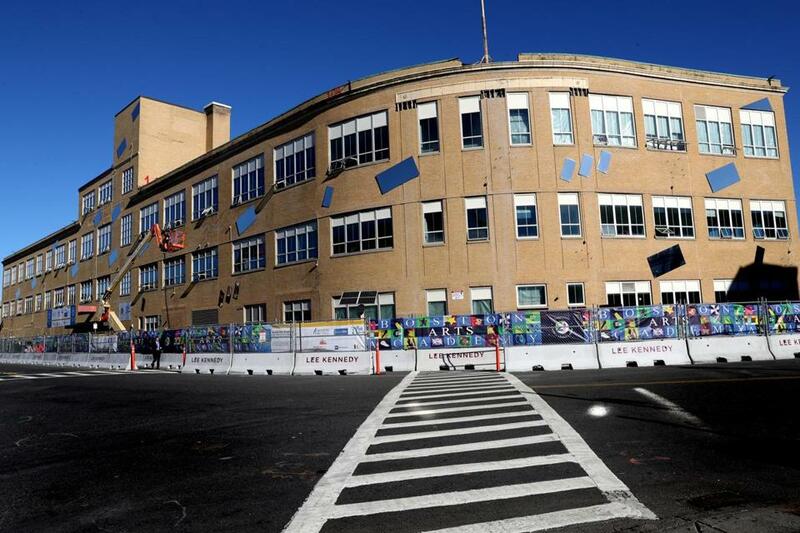 The McCormack Middle School in Dorchester, which serves roughly 400 students, was also notified Tuesday that it could close at the end of the next school year, representing the first in a wave of middle-school closings in the coming years. While the proposal calls for school closings, it does not plan to take buildings offline — at least based on the information shared in a media briefing Tuesday. Instead, the buildings would be extensively renovated to allow for the opening of a new school or the relocation of an existing one. The 12 new or renovated schools include two already underway — a new Boston Arts Academy and a third building for the Eliot K-8 School in the North End — and two currently in the planning process. Those projects are a new Quincy Upper School in Chinatown and an extensive renovation of the Carter School, which serves students with profound disabilities. Four other projects involve reconstructing the West Roxbury complex and extensively overhauling the McCormack, Timilty, and Irving middle schools after they’re vacated. Details on four other projects were vague, but would target such neighborhoods as East Boston and Mattapan. Some teachers and advocates are already questioning whether the plan will need far more than $1 billion. BuildBPS has spent or earmarked more than $300 million to date, according to a Globe review of School Department data. The proposal aims to go beyond just school building projects and attempts to address other educational issues, such as reducing the variety of grade spans across the system. Under the proposal, Boston would become a system predominantly of lower-grade schools that extend to grade 6 or 8 and secondary schools that begin at grade 7 or 9. That move would cause an unspecified number of school consolidations. Currently, many of Boston’s elementary schools end at grade 5, and a number of them are physically too small to add a sixth grade, which means various pairs of schools could consolidate so that one offers early elementary school grades and the others would house the upper elementary school grades. Dorchester and South Boston would likely be the first neighborhoods to feel the effect of this change. The closing of the McCormack would have a domino effect, causing seventh and eighth grades to be added to Excel High School in South Boston, even though the school is struggling academically and was declared underperforming by the state. At the other end of the spectrum, two of the three small elementary schools in Dorchester that feed into the McCormack — the Clap, Everett, and Russell — could wind up merging into an upper and lower elementary school. Perille said those kind of pairings will be the subject of community meetings to see if the arrangement could work. It is unclear what would happen to students at the K-5 Dever Elementary School, which is adjacent to the McCormack. School officials hope this will be the beginning of a school construction boom, which Boston has not experienced since the 1970s. The first BuildBPS building actually opened in September: the Dearborn STEM Academy, the development of which began about a decade ago. Boston Arts Academy, located across the street from Fenway Park, will, however, likely emerge as the most visible sign of the effort. During construction, the school has been temporarily located to Dorchester.